I love lamb chop lollipops so hard. They’re a super crowd-pleaser that look so gorgeous and complicated but, and please keep this a secret, they are so darned easy. 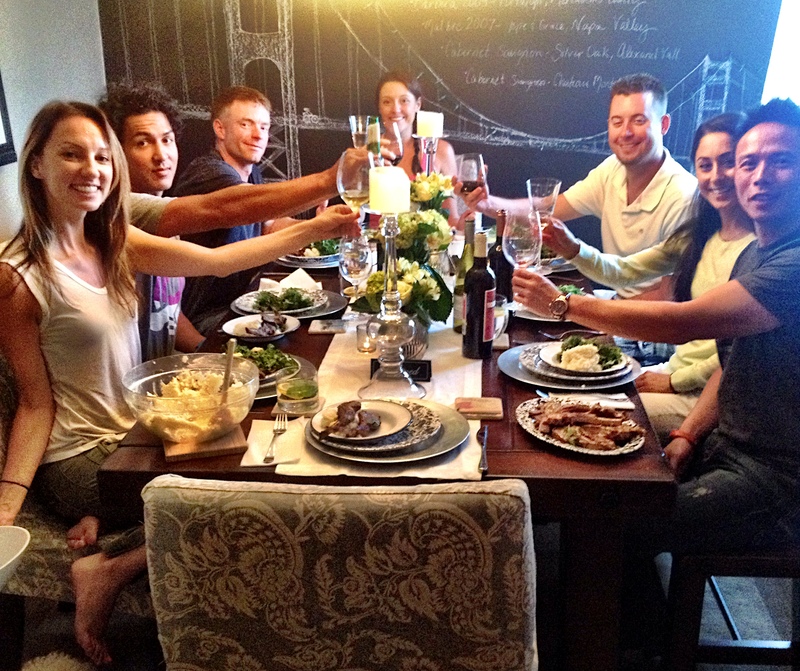 Don’t tell your friends that really all you have to do is separate, season, and sear them. Really. Don’t tell them that. I’d hate for my friends to think that these are so easy I could make them in my sleep. Just to make sure they know how much I “slaved” over these all day, I put my hair in a bun, muss up my clothes, and spray a little mist for the “I sweated over these all day” look. Below we’re going to do a little lesson on how to butcher these suckers (it’s easy) and then properly cook them. 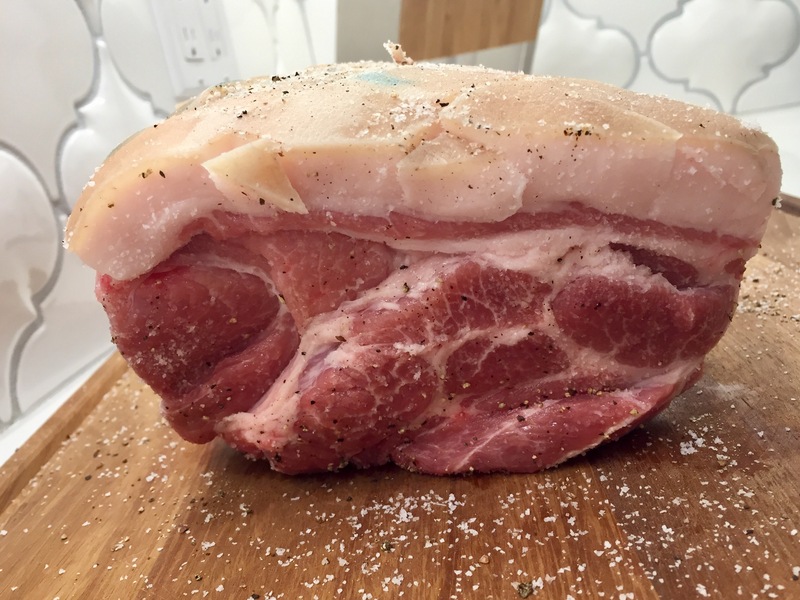 The chops can be easily cooked with just a little salt & pepper, but we’re going to go for a Significantly Above Target rating by following the below steps. Warning, with each step you add to the fun. TO FINALIZE THE UNSTOPPABLE FUN…. serve on my new Crow Canyon Home Splatterware! 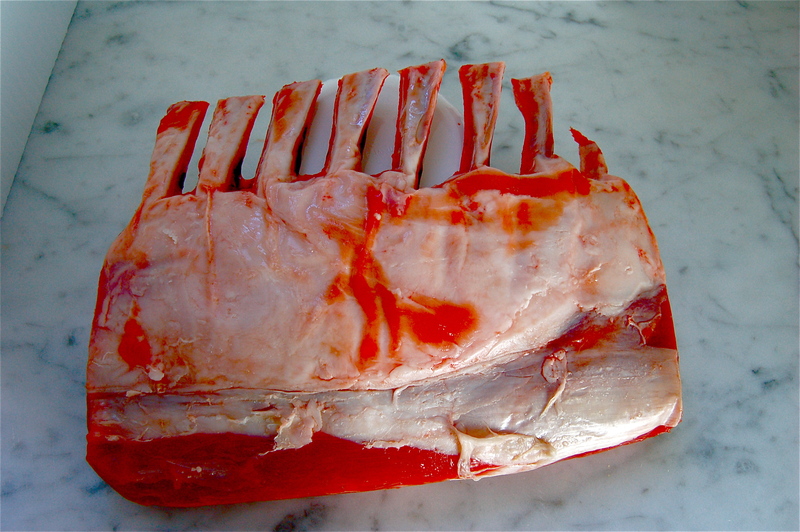 Lamb chop “lollipops” are made from a rack of lamb where the chops have been separated, seasoned, and seared. 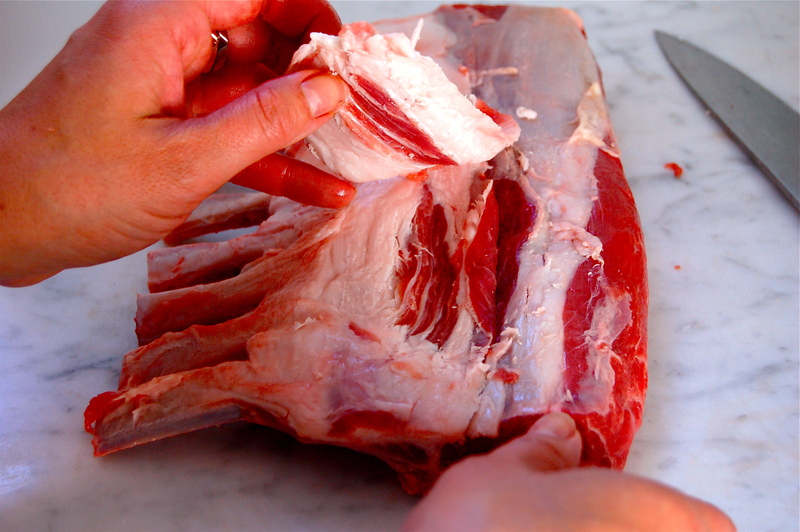 Below we’re going to show you how to properly butcher them, season & sear them. The simplest version of these are made with just salt & pepper. 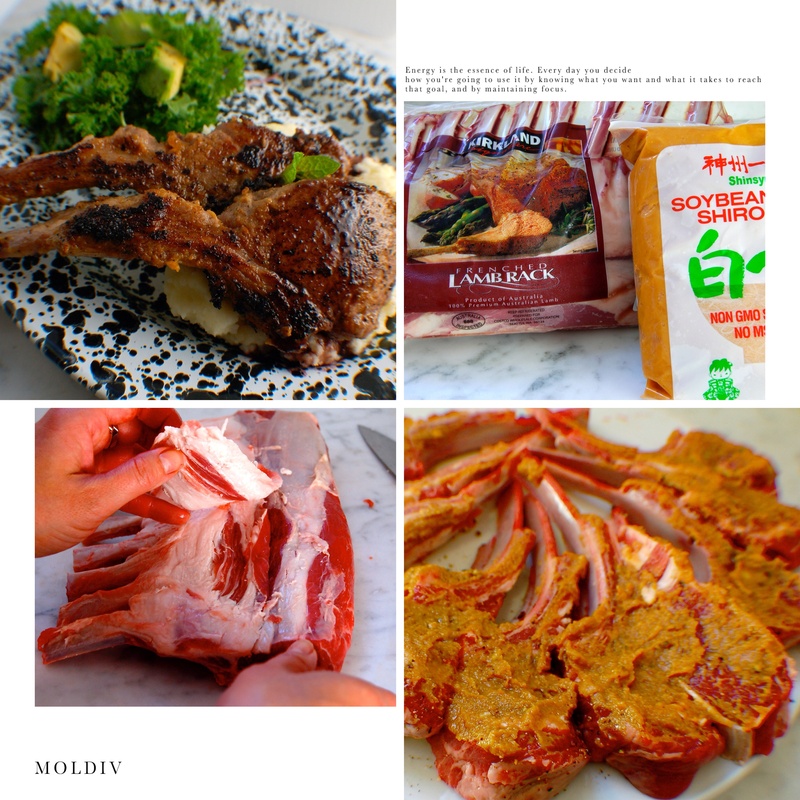 I’ve added a marinade, a sauce, and a link to mashed potatoes that will turn simple lamb chops into simply fabulous lamb chops. 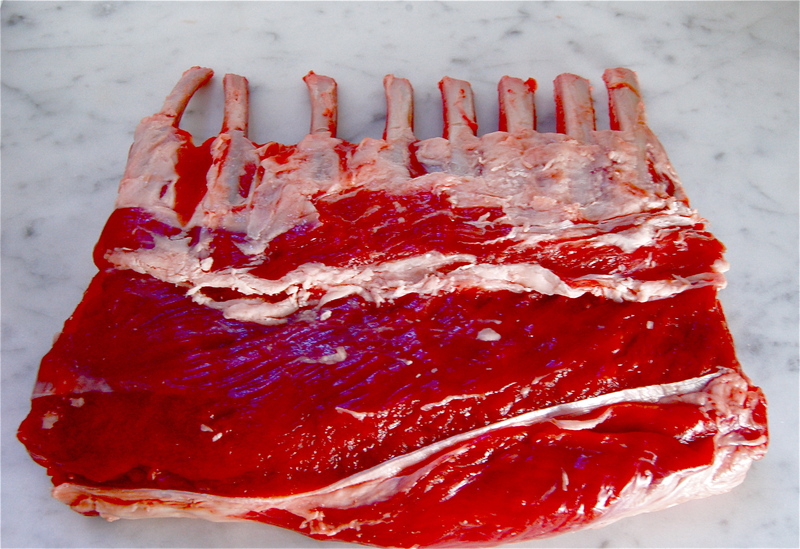 Lamb Chops can be found at any butcher or grocery chain and are usually from Australia, New Zeland, or the United States. Lamb Chops are a case where I break my rules of buying the best organic, local, grass fed, free range and perfectly manicured animal. I buy my lamb chops at (brace yourself) Costco. 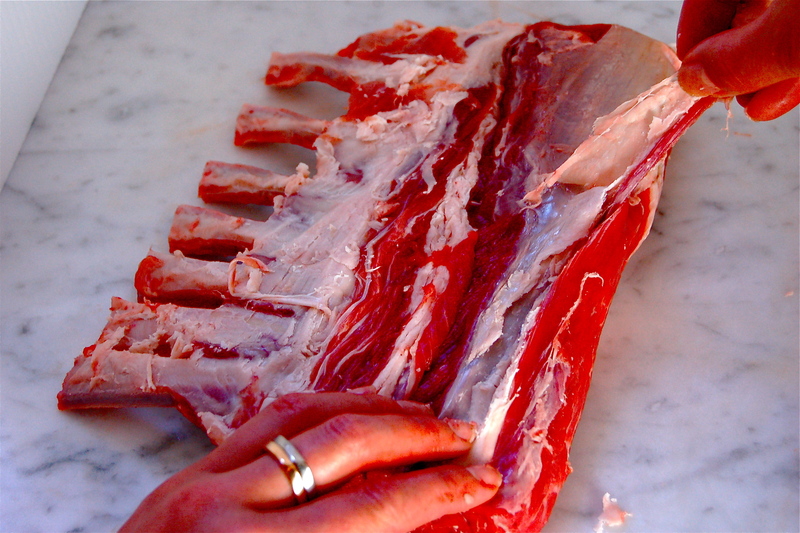 What you’re looking for in lamb chops is large meat-to-bone ratios and not a ton of fat. Costco has higher fat than most I’ve seen, but other sources I’ve found for lamb chops have very little meat on the bones. In this case, more meat/bone > fat ratio. And that completes my extent of math for the day. Costco’s Kirkland lamb chops are sourced from Australia and are plump, meaty little things. To prepare the chops, first wash & pat dry. 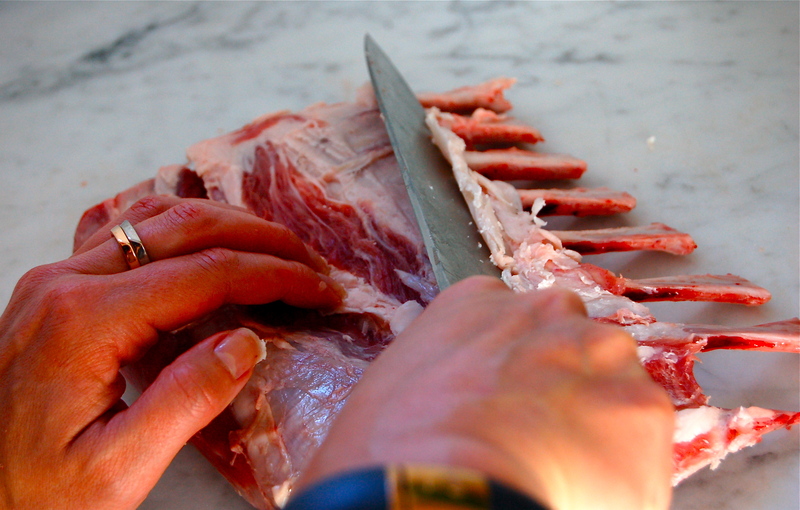 Place so the bones curve down on a clean cutting surface and grab your sharp chef knife. 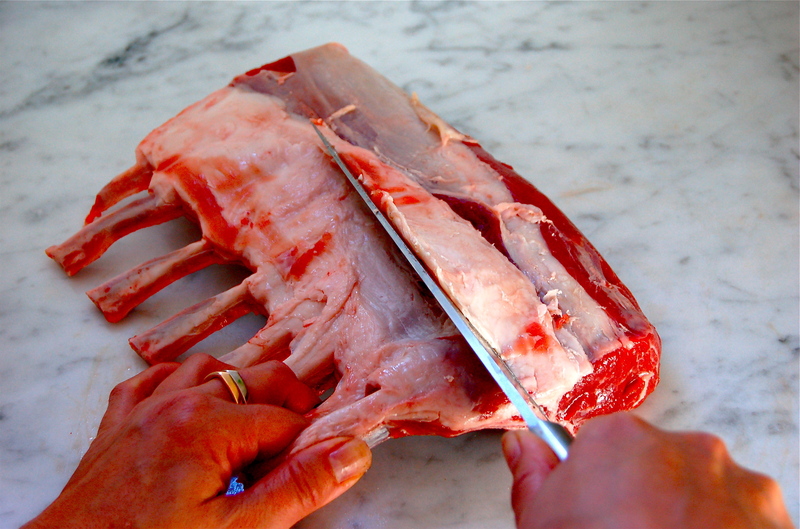 There is a large “V” of fat about mid-way, where the chop starts to meet the bone. 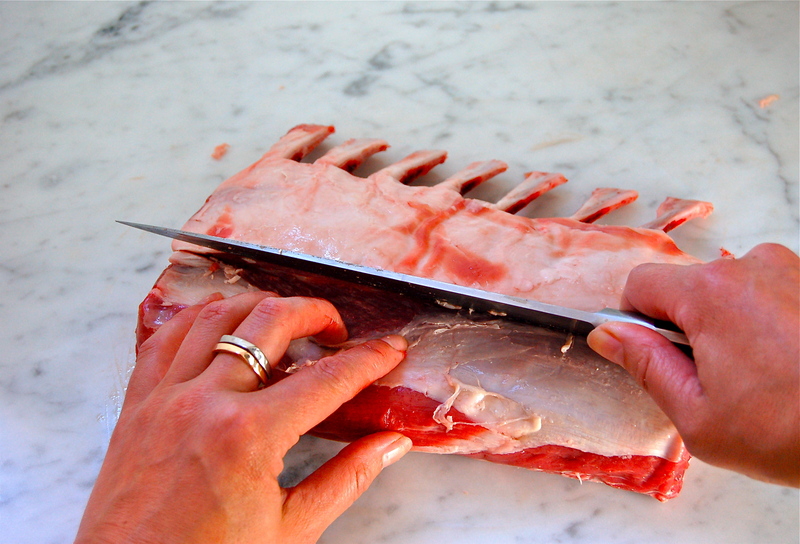 Angle your knife at 45 degrees and slice down until you reach the bottom of the “V”. Then, approaching from the opposite side, do the same. Here are some photos for you visual learners. 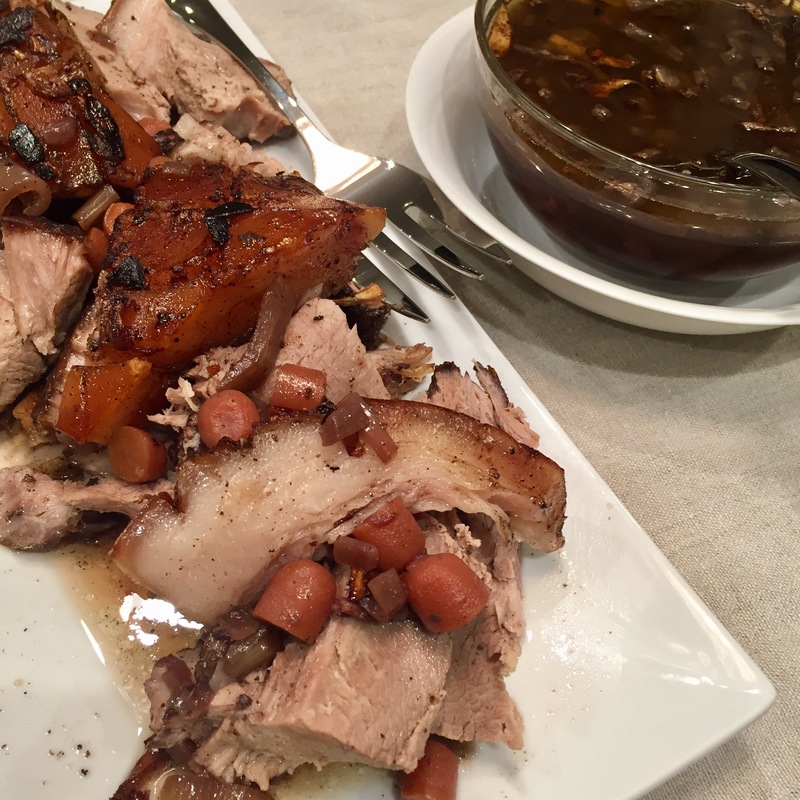 Next, there is a layer of fat along the bones. 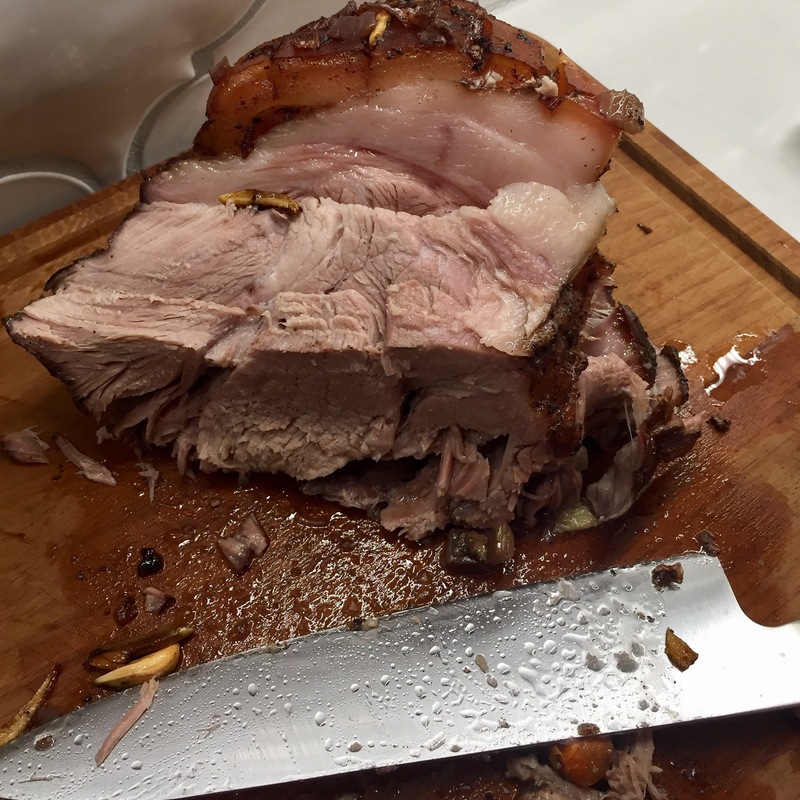 Angle your sharp knife along that layer of fat and carefully “shave” off this thinner layer. Now, to get that pesky little tendon along the bottom of the chops. Here’s a little trick I learned from watching too many cooking shows on Sunday mornings. Once you get this bugger going, you can just pull it off. 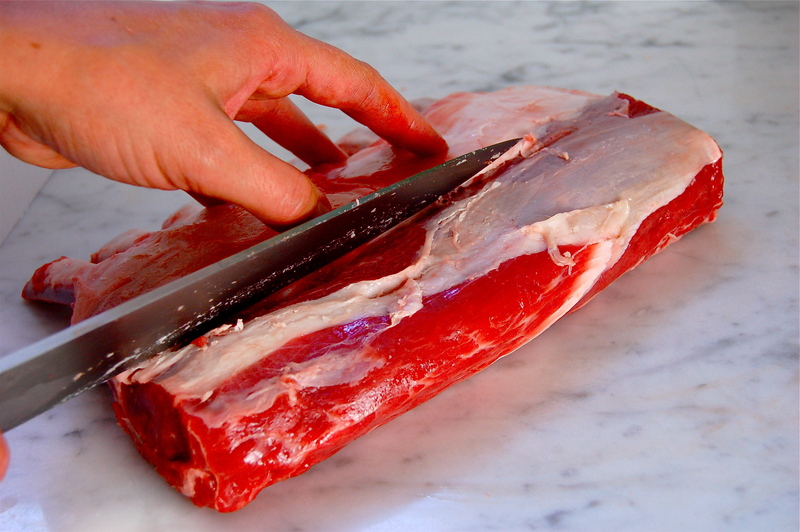 Make a small slice in between the tendon and the meat, grab hold, and pull off the meat. 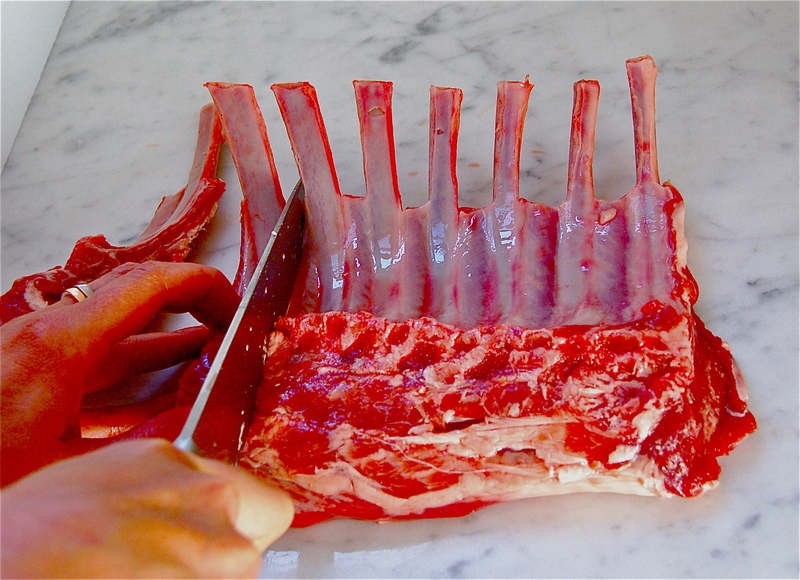 To finish, flip these little buggers over and slice in between the bones to make your lollipops. 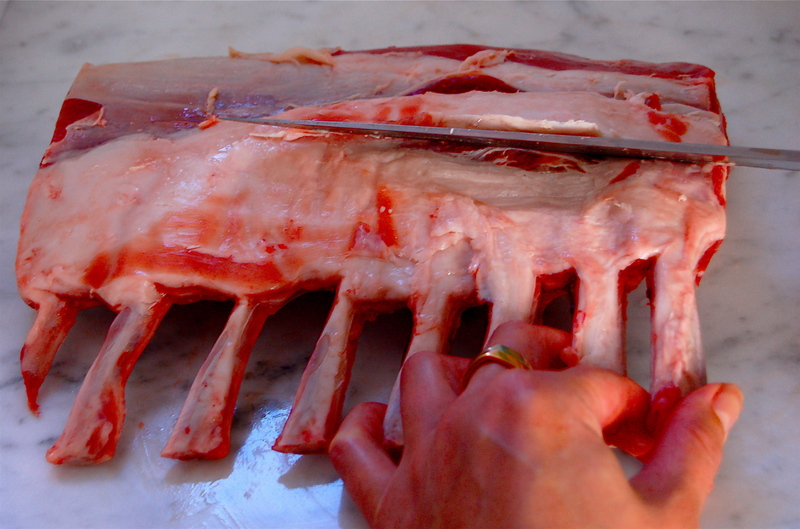 Clean, dry and butcher the lamb per the above. Sprinkle with salt & pepper and set aside. In a small bowl, mix together marinade ingredients (miso, soy, lemon, ginger. 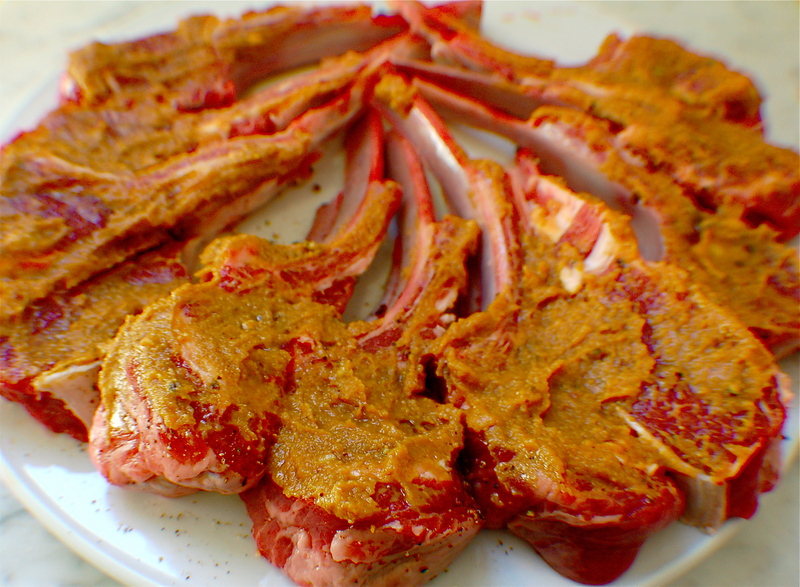 Spread marinade over all sides of the lamb chops and set aside for about 20 mn to marinade and make friends with each other. 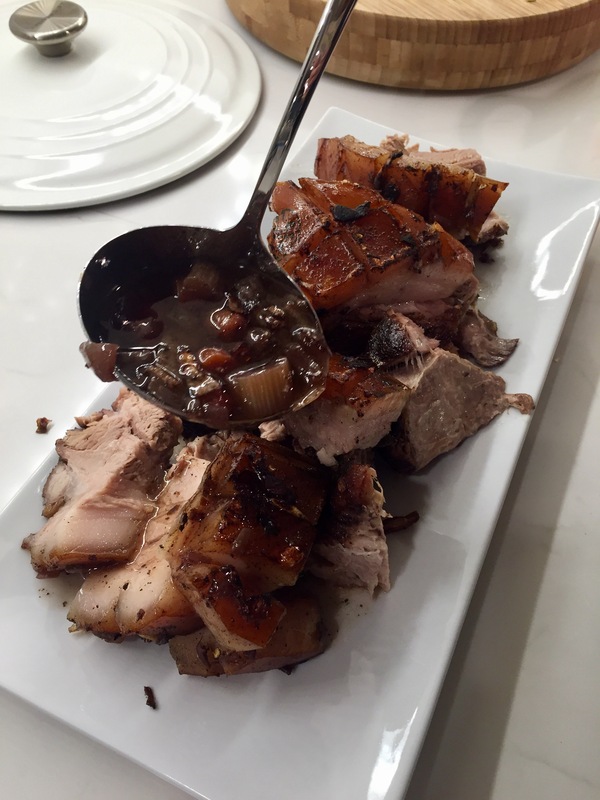 Set chops aside to rest for 5 minutes while you whip up some red wine reduction sauce. Place pan back on the stove on the same medium-high heat. Add the wine (you may want to hold your pan lid over the pan as the wine reacts with the oil and it goes everywhere for about 5 seconds). 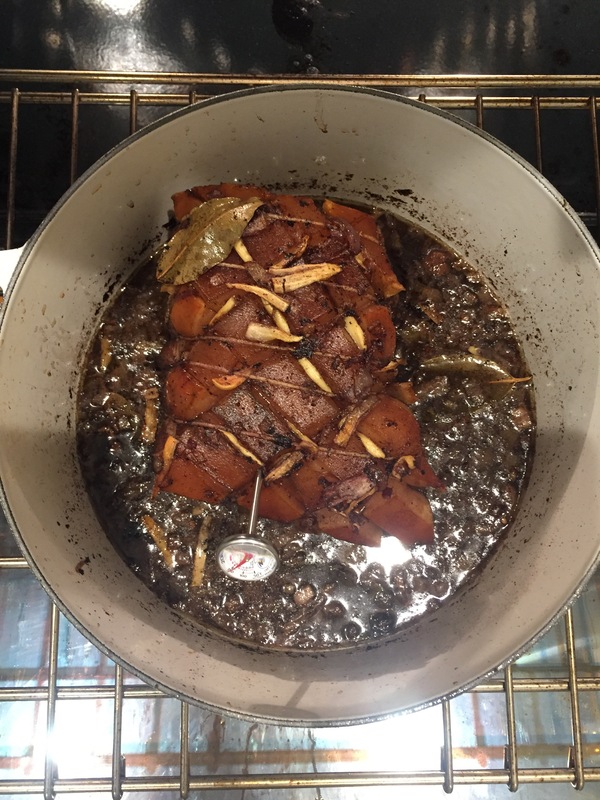 Note: NORMALLY on a red wine reduction sauce I would tell you to scrape up the meat bits – this is part of the point of a reduction sauce – BUT the miso soy marinade gives off a burned sugary soy carmel flavor, which, trust me, is a strange combo with the red wine. Allow the red wine to reduce to 1/2 of the volume and remove from heat. Whisk in cold butter one cube at a time, allowing each cube to fully immerse with the red wine before adding another. Add salt & pepper to taste. 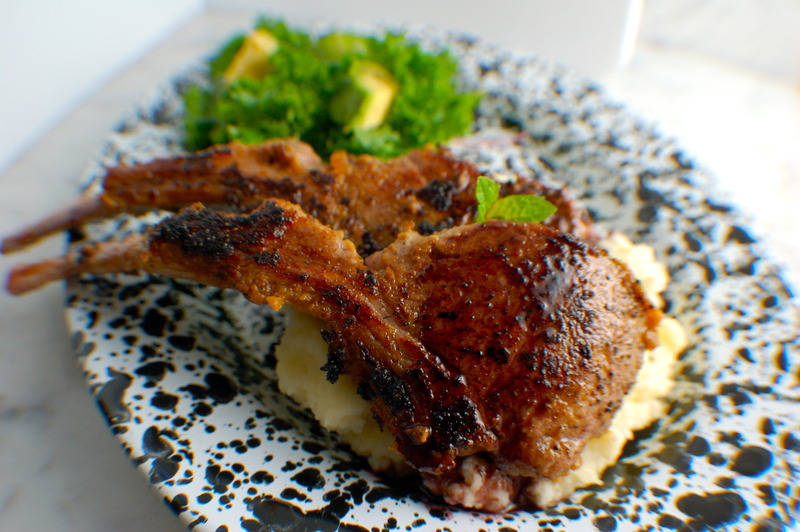 Place lamb chops over wasabi mashed potatoes and drizzle the red wine sauce on top. Now you have absolutely delicious lamb chop lollipops! And since you know how to separate, season & sear them, feel free to play with your own favorite marinades, rubs, or serve them with simple salt and pepper. 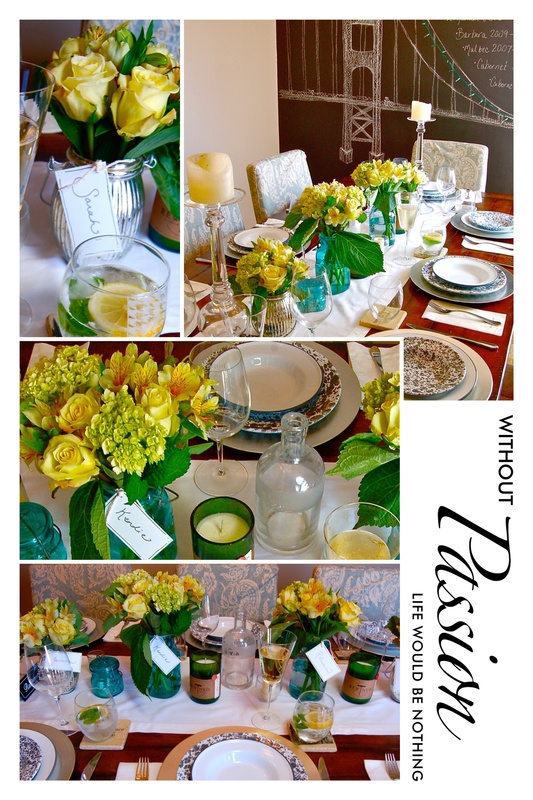 Set your table with pretty splatterware, invite all your friends, and don’t forget to muss up your hair for the “I slaved over these all day” effect.